The Beatles 50 Years Ago Today: October 14, 1967. Beatles Radio: The Beatles, Solos, Covers, Birthdays, News The Fab 4 and More! 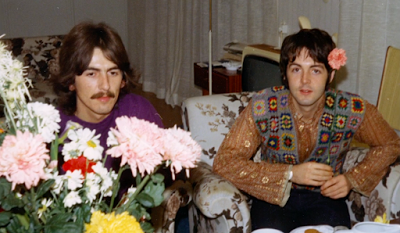 October 14, 1967, George Harrison and Paul McCartney went to Sweden to visit the Maharishi at the hotel where he was staying in Falsterbo, a seaside resort in southern Sweden near Malmö. 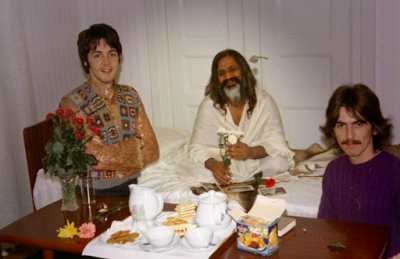 They made the trip to persuade the Maharishi to stop using The Beatles' name as PR for himself. Swedish Television recently aired "Året var 1967" ("The Year Was 1967"), where they touched upon the subject and showed these photos. A couple of Beatles in town of course caused quite a bit of commotion, fans would gather and Swedish Television sent a camera team to interview the two of them together with the Maharishi.